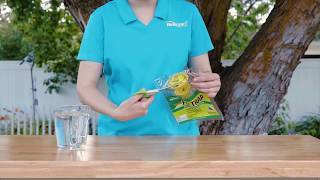 The RESCUE!® Disposable Fly Trap is intended for use outdoors. It will help control flies outside and keep them from getting indoors. We recommend hanging the trap around 20 feet away from any outdoor living spaces. 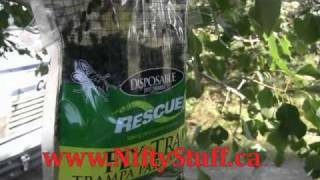 For those areas with heavy fly infestations, such as farms and ranches, we created the RESCUE!® Big Bag Fly Trap. Best Way to Catch Flies! This is the best way to catch flies!! It smells terrible, like dead animal, so just don't hang it in the house! The flies have been terrible this year! 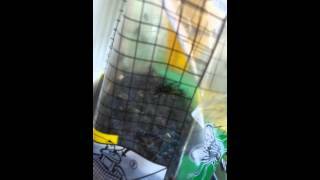 On a recent camping trip, they got so bad that I had to do something, so I bought a Rescue Fly Trap. I was so impressed that I bought more when we got back home. My wife and I like to sit outside in the evening, but the flies made that impossible. So, I hung up a fly trap. Although not ALL of the flies are gone, the change is noticeable. This works 100% better than anything on the market that I know of. It may be Stinky, but it works. Don't hang it close to your entry doors or windows. I hang my traps from my Tuff Shed, maybe 20 feet. I can leave my door open and no flies will come inside. YaYa Rescue! I just started raising free-range, backyard chickens. I also began attracting some summer flies, which would be landing on my arms and, bothering me. So I hung one of your traps next to the coop and by evening there were hundreds of flies in that trap. I couldn't believe there were that many in the area! This is only the third day and I am looking to replace it because it is so full and beginning to stink. I'm hoping I can purchase in bulk.